Preheat oven to 200°C (400°F). Heat the oil in a non-stick frying pan over medium heat. Cook the onion for 4–5 minutes each side or until dark brown. Divide the vincotto between 4 x 9cm lightly greased pie dishes and top each with a round of onion. Using an 11cm round pastry cutter, cut out 4 rounds from the pastry. Place on top of each onion round and, using a small palette knife, tuck the pastry edges under the onion. Cook for 20–25 minutes or until puffed and golden. Working carefully, immediately turn out the tarts. 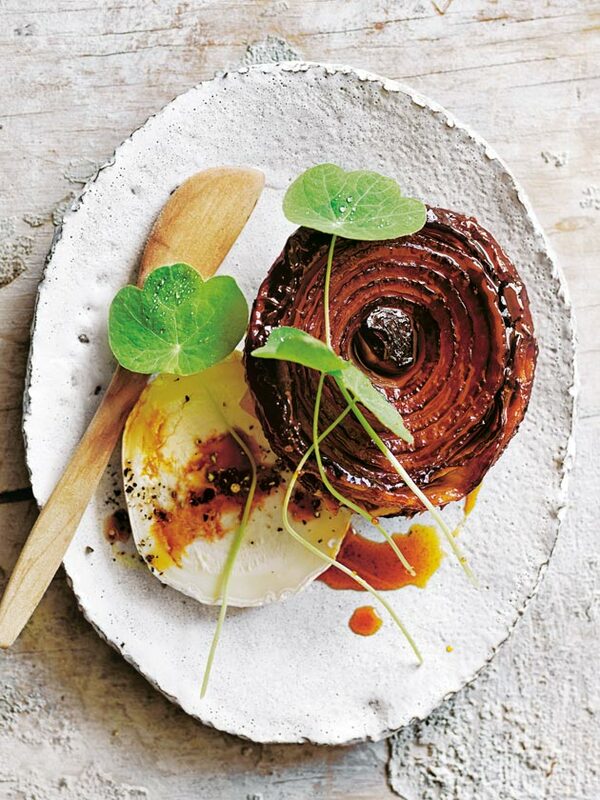 Sprinkle with salt and pepper and serve with the goat’s cheese and nasturtium. Makes 4. + Nasturtium leaves are available from select greengrocers. You could also serve with watercress instead.